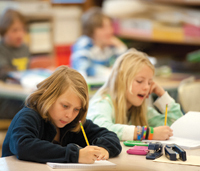 The Blaine County School District is in a better position than many school districts throughout the United States to implement state-mandated “common core standards,” an initiative intended to improve math and English language arts so that that students are better prepared for college and to compete in a global economy. That was the message from School District representatives at a panel discussion Tuesday on the new education initiative held at The Community Library in Ketchum. About 40 people attended the event. Wood River High School language arts teacher Darlene Dyer said she and other teachers in the district are already teaching to the new standards, which become officially adopted in Idaho for the 2014-2015 school year. “I’m glad I’m in the Blaine County School District because I have friends around the state that haven’t had any training in common core,” Dyer said. Besides Baker and Dyer, other panelists were Rod Gramer, CEO of Idaho Business for Education; Jenny Emery Davidson, director of the Blaine Center for the College of Southern Idaho; Evelyn Johnson, executive director of the Lee Pesky Learning Center; and Angie Martinez, Blaine County School District director of curriculum, teaching and learning. The panel discussion was mainly focused on the Idaho Core Standards policy, which is supported by Gov. Butch Otter and state schools Superintendent Tom Luna. The Idaho Core Standards policy—which was approved by the state legislature in 2011—is the state’s methodology for implementing common core standards, a national initiative developed by various state government leaders and now supported by the federal government. Idaho is one of 45 states that have adopted the new standards. In introducing the panel at Tuesday’s discussion, Community Library Executive Director Cynthia Dillon said “many Idaho students struggle in college.” She cited statistics indicating that while 92 percent of Idaho students graduate from high school, only 46 percent of them go on to post-secondary education. Of those who do, many need remediation in math or language arts and many others drop out after the first year. Gramer said further that the need is there for higher education as the requirements in the workplace become more complex. “There’s a huge gap between our present workforce and what our future workforce needs to be,” he said. Davidson said the problems with education in Idaho can be detected when students enroll in college and that at CSI as many as 75 percent of new students need remedial help in language arts. “We can do better in Idaho in terms of developing a higher academic culture,” Davidson said. The new common core standards are intended to provide consistency across the United States in levels of student learning. The intent of the new standards is to challenge students with more complex literature, to teach them proper writing skills, to provide them with increased vocabulary, to help them understand the concepts behind mathematics and to help them to know how to apply mathematics to real-world situations. Baker said that Blaine County School District patrons seem supportive of the new standards. Dyer said many school teachers are also supportive of the new standards. A local positive attitude to the new standards is not necessarily shared across the nation, as opposition to common core is increasing and some states are even considering opting out of the program. Critics complain that the common core initiative gives state and federal governments more power in local education, that implementation is too expensive, that the new standards are untested and that the standards will stifle individual student development. Gramer said there’s a movement now in Idaho to repeal the standards. “It’s very important that you talk to your legislators and tell them how important this is and not to repeal it,” Gramer said.